Mailbox locks are available in standard version with two-point locks and as reinforced locks. 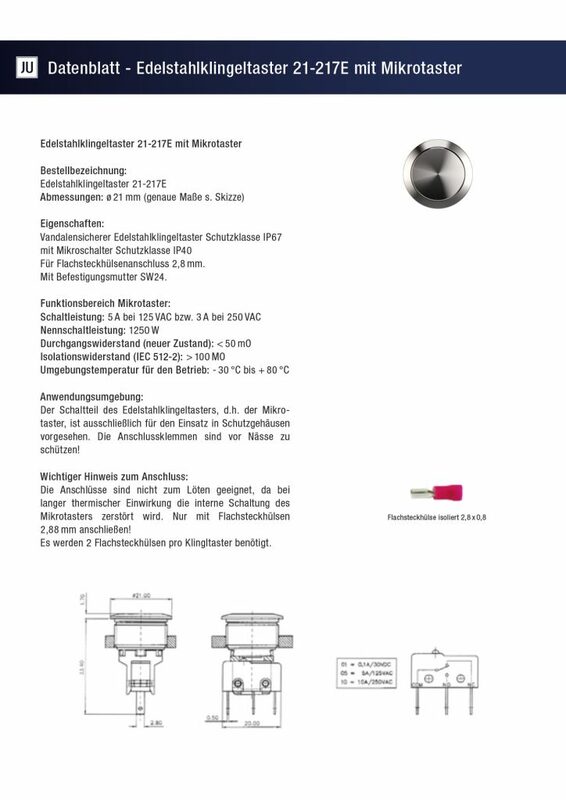 Special punchings for the integration of locking system cylinders from third-party manufacturers are possible after specifying the product used. Name plates are available in a standard version (plastic plate) in anti-vandal design as well as theft-proof scew-on plates with or without a name engraving. Doorbell buttons are available in round design as pushbuttons, as a combi button (name plate with integrated doorbell button), as well as as a button made of stainless steel, illuminated or non-illuminated. Intercom grids are available in standard version made of aluminum profile as well as for steel and stainless steel parts in laser-finished design (customer-specific patterns can be taken into account). Aluminum components can be engraved or completely engraved. Engraving in stainless steel is possible in engraved and deposited versions, whereby perforations can be backlit. In addition, all Windows compatible fonts (Truetype) are possible in font heights or based on the space available. Special engravings (symbols, coat of arms etc.) can be made upon prior consultation. For more information on engraving, see page 172. 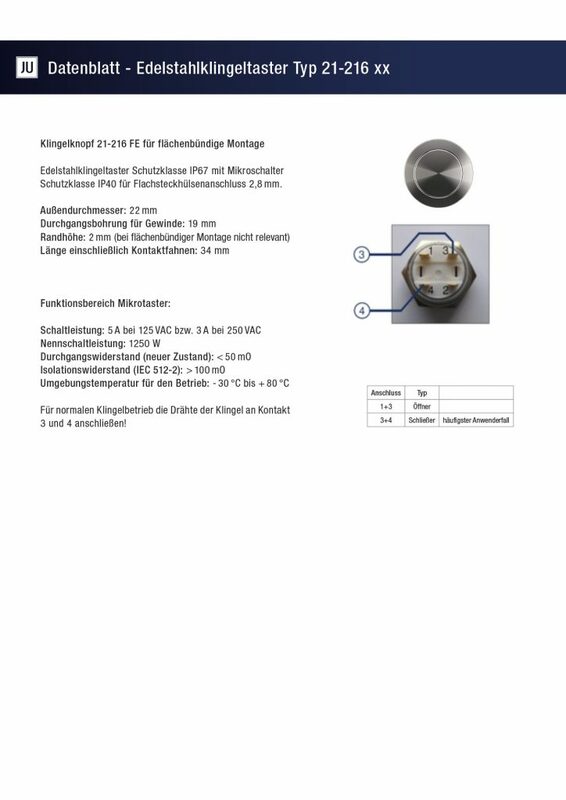 The dimensions are indicated in the following order: width – height – depth in mm. They are valid for each individual compartment with the DIN tolerances. Our general conditions of sale apply to all deliveries and offers. All deviating arrangements require our confirmation in writing. In addition, the statutory provisions apply. Up to a net value of EUR 500.- delivery is not free of charge. Starting from EUR 500.- delivery is free. 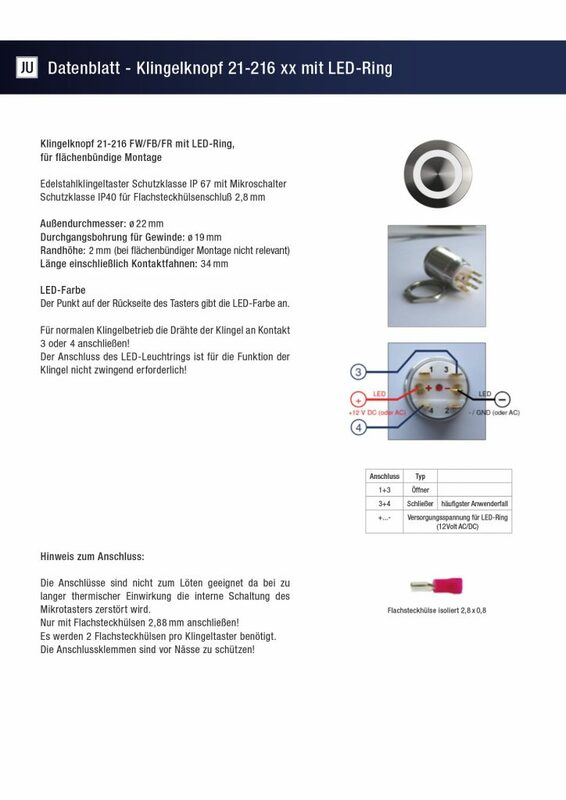 Up to a net value of EUR 150.- we charge a packaging cost of EUR 2.50. Indication of the delivery week means the date of dispatch from the factory or delivery warehouse. The conformity of our products with DIN EN 13724 as defined in the applicable guidelines corresponds to the current needs of the market. All products which meet these essential requirements are marked with the CE symbol (see fig.) and can be freely marketed in the European internal market. The supplied goods shall remain our property until complete fulfillment of all claims and demands arising from the business relationship towards the customer, including possible interest on arrears and other costs. The supplied goods may not be sold, pledged or surrendered as long as they remain our property. Should it be seized by a third party, we should be notified without delay. The claimant should be notified that the goods are our property. We reserve the right to make changes to the dimensions and finishes as a result of further development of our products, as well as amend prices. Upon publication of a new price list, all previous price lists shall be deemed invalid. 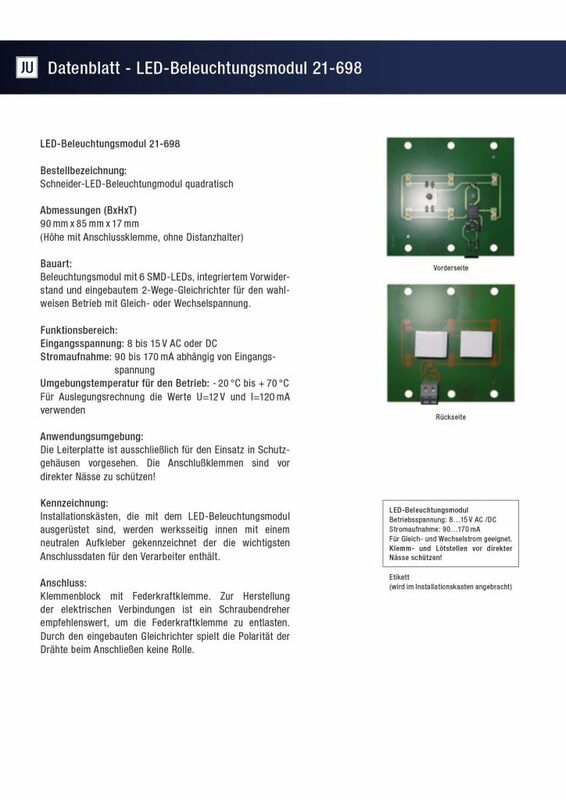 DIN EN 13724 replaces the previously valid DIN 32617 and specifies the requirements and test methods for mail slots which are valid in accordance with the manufacturer installation instructions. DIN EN 13724 considers protection and break-in safety as well as user-friendliness and security for the user and ergonomy and efficiency for the deliverer. The mailboxes marked with DIN EN 13724 or DIN in the JU catalogue comply without exception with there quirements laid down in the standard. For ergonomic reasons, the slot should range between 700 and 1,700 mm (for intercom systems, we recommend 1,200 to 1,450 mm height). Furthermore, DIN EN 13724 contains guidelines and notes on the effort required to open and close the flap, fire protection regulations, confidentiality, removal safety, distance measurements, mail stacking height. The fulfillment of the DIN EN 13724 requirements must be proven by the correspondingly defined test requirements. All our products marked with the DIN symbol comply with DIN EN 13724. Mailboxes, tray folds and letter distribution systems are to be arranged in such a way that they are at any time easily accessible and handy, whereby private banks of mailboxes and individual inhouse mailboxes should be attached in such a way that they can be operated without entering the buildings. 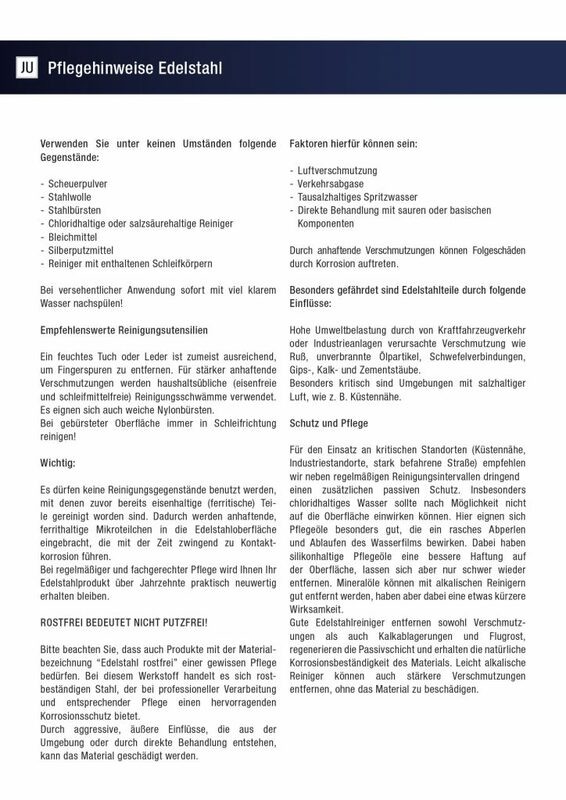 Note: According to Landgericht Berlin, judgment as of 11.05.1990, AZ 29 S 20/90, non-compliance with the DIN standards resulted in rent reductions. The powder-coating for JU products has a layer density of 100 µm and is baked at approx. 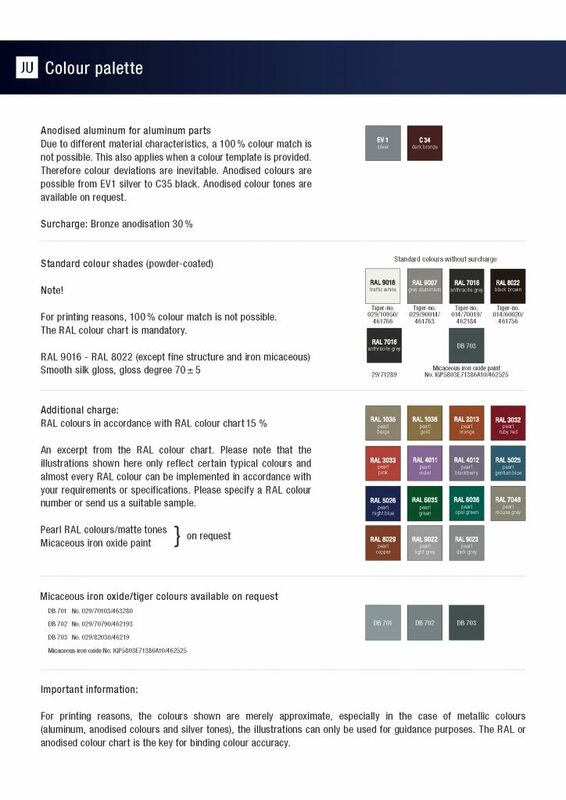 200 ° C. The colouring is possible with all colours of the RAL colour chart, whereby assemblies can be designed in different colour shades. Assemblies made of aluminum can be provided with anodised coloured tones according to the colour table of the main catalogue. The colour reproduction according to the JU colour palette on page 180 is only approximation. The RAL colour, the anodised colour and the RAL colour chart are binding for the precise colour. Due to different material characteristics, a 100 % colour match is not possible. This also applies upon presentation of a colour sample. Therefore, certain colour variations are inevitable. In the event of slight colour deviations within the light-dark tolerance as well as in the case of anodised parts, slight deviations can be acceptable for the customer.